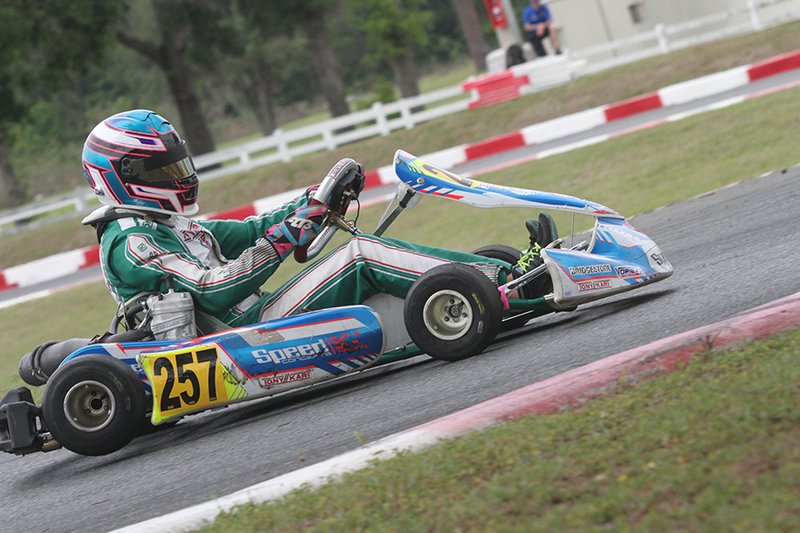 The 2018 United States Pro Kart Series – presented by MG Tires and Nitro Kart – opened up with its inaugural visit to the Ocala Gran Prix facility in central Florida. The Southern Grand Prix is serving as the opening two rounds of the championship chase, kicking off the sixth season of the program. Perfect conditions on Friday practice turned into unpredictable weather on Saturday. Rain threaten throughout the day, eventually coming down for roughly one minute during the second round of heat races. Despite the rain, no driver hit the course on wet MG Tires. The high winds and the sun returning allowed for the track to dry very quickly after the sudden and brief downpour. There was nothing unexpected during the racing action, as seven drivers started out the season with victory. Austin Garrison has likely thousands of laps around the OGP circuit as a former team driver. That along with a perfect working Fullerton chassis provided him with a sweep of the X30 Pro division. Garrison never put a wheel wrong all day, and led from qualifying to the final checkered flag. It seemed like the day was going to be exciting up front, with the top-six in qualifying separated by just 91 thousandths. Garrison of course was P1 with a 37.023-lap. From there he led wire-to-wire in both heat races and the main event, pulling away to a six-second advantage. The battle ended up being for second all day long. Armin Cavkusic (FMS / FA Kart) improved after each heat race from qualifying seventh, and used his P3 starting position to grab and keep the second spot throughout the main event. Alex Bertagnoli (FMS / Kart Republic) ran third with Brandon Jarsocrak (KSNA / Kart Republic) and Zach Hollingshead (OGP / Tony Kart) completing the top-five. Hollingshead was the only driver to pull the double duty in the Senior ranks, racing KA100 Senior as well. It was the OGP / Tony Kart driver that would set the tone in this category. After qualifying fifth, the Senior rookie jumped up to the front. The Florida driver won both heat races, earning the P1 starting position. 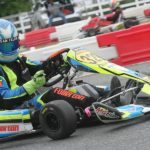 Top qualifier Dylan Gennaro (Top Kart) stole the position in the opening lap of the Final, as the field was a long train for a number of the opening laps. The top four were able to break away, with Gennaro leading. Hollingshead took back the lead on lap eight, and from there pulled away with fast laps of the race. At the line, Hollingshead celebrated his first USPKS victory by a near two-second advantage. The driver to watch was Josh Hotz (FMS / Merlin). After qualifying third, Hotz had two tough heat races to put him back in ninth on the main event grid. As the second quickest kart on the track, he reeled in the pack Hollingshead left behind, and put himself into second. Hotz was unable to gain much on the leader, settling for a solid second place finish. The fight for third went down to the wire with Morgan Healey (OGP / Tony Kart), Gennaro and Colton Ramsey (Innovative / Kart Republic) dicing it out. On the final circuit, contact between Gennaro and Healey took both off the podium, giving the third step of the podium to Ramsey, moving TJ Koyen (Innovative / Exprit) to fourth and PJ Lyda (Merlin) to fifth. Tyler Gonzalez nearly pulled off a perfect day in the X30 Junior category. 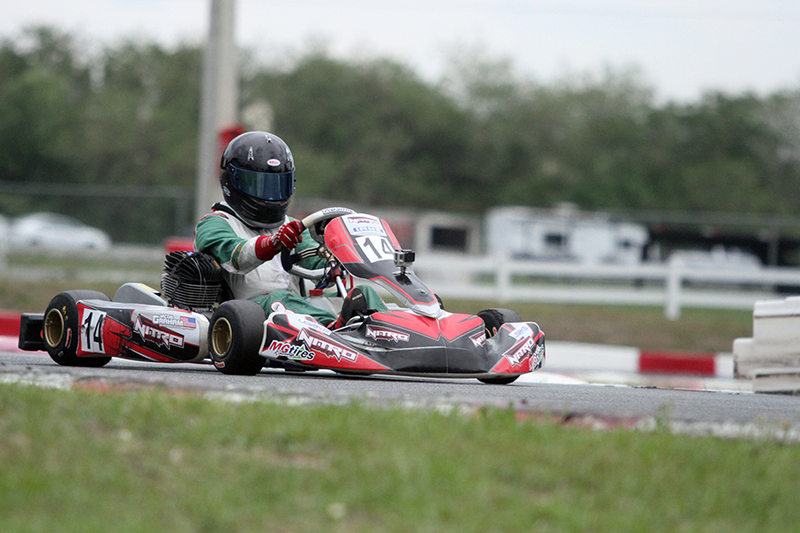 Gonzalez (SRC / Tony Kart) set fast time in qualifying and went unchallenged to the win in Heat #1. A deflating tire in Heat #2 slowed his pace, allowing Kyffin Simpson (SRC / Tony Kart) to take the win. The main was all Gonzalez, driving away to a nine-second advantage. The fight for second was hotly contested until Simpson secured the position with Kyle Thome (FMS / Merlin) able to grab third ahead of Pauly Massimino (KSNA / Kart Republic) with Lucas Smalec (FMS / Merlin) in fifth. 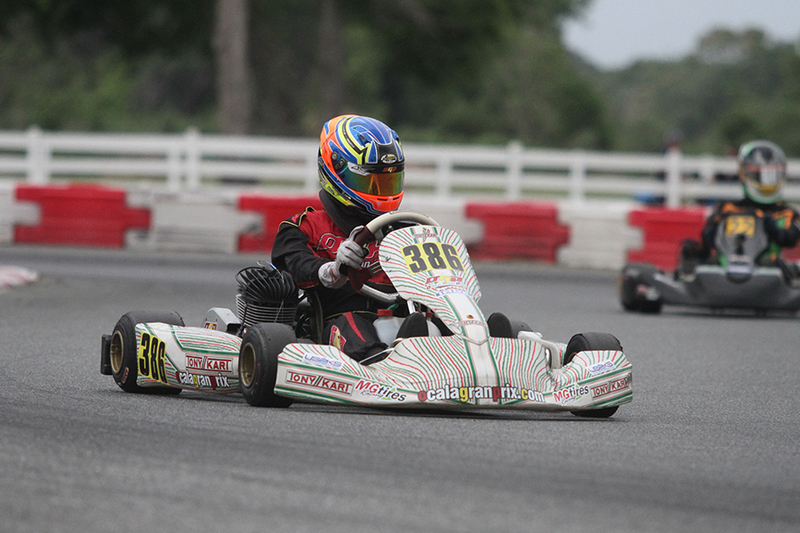 The day belonged to Jacob Graham in the new KA100 Junior division. Graham (Nitro / Kosmic) will go down as the inaugural winner to the category with a solid performance. He took the opening heat win comfortably after qualifying second. The class was the first on track after the rain delay, with the opening corners a little touchy with everyone on the slick tires and the track needing a few laps before it was fully dry. Graham slipped back to third under the tricky conditions, fighting back to take the win. He set sail in the Final, driving away to a near five-second advantage. Erikson Evans (Kosmic) held on to take second with Tyler Wettengel (KSNA / FA Kart) crossing the line in third. 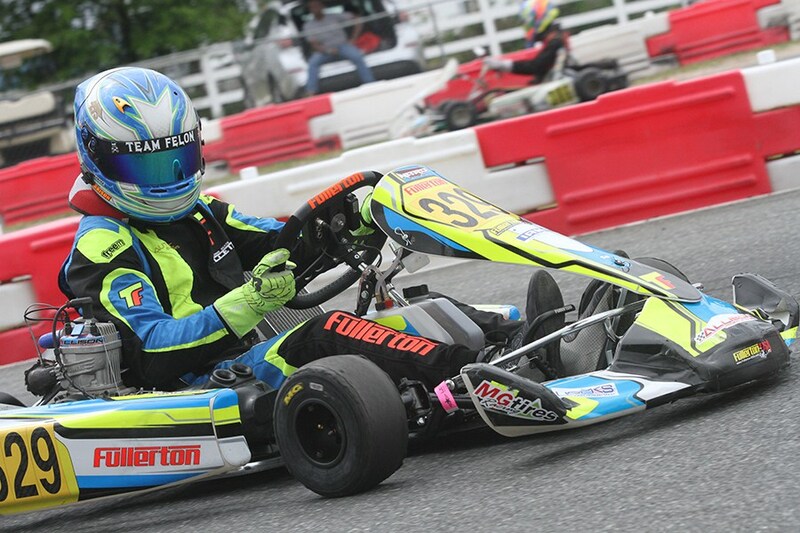 He was given a two-position bumper penalty, handing the spot over to Spencer Lofton (Tony Kart) with Taylor Maas (FMS / Merlin) moved up to fourth. X30 Masters made its return back to the USPKS program, after running as one of the inaugural categories with the Leopard engine. The day was a duel between Jonathan Silva and Scott Roberts. Silva (FW / CompKart) set fast time in qualifying and led the majority of the heat races. That was until Roberts (OGP / Tony Kart) took the lead and the win both times. Starting on the front row for the Final, the two only made it to turn one before contact took them both out of the race. This was a big gift for Scott Speed. The former F1, NASCAR driver now multiple champion in the Red Bull Global Rallycross returned to his roots, jumping in a SCR / Tony Kart with zero practice on Friday. Qualifying fifth, he worked his way up to the third by Heat #2. When the two leaders pushed off in turn one, that was all Speed needed, leading all 22 laps for his first USPKS victory in his first race in the Masters category. Danny Robertson (OGP / Tony Kart) ran second but suffered a four-position penalty for a bumper issue. That promoted Scott Falcone (KSNA / Formula K) to the second step of the podium and Rob Maier (Tony Kart) to third. When the other penalties were all handed out, Brian McEvoy (FMS / Merlin) ended up fourth with Kim Carapellatti (CompKart) in fifth. The Mini Swift division put on a great show all day, including the survival of the one-minute rain shower that hit the facility during their second heat. Alex Powell was the the top driver in all the conditions, putting himself at the front in qualifying and both heat races. Powell (Energy) was among the lead group in the Final, joined by Kai Sorensen (Benik), Christian Miles and a charging Jeremy Fletcher (Tony Kart) who started 10th. Miles put himself into the lead and tried to get Powell to work with him to get away from the other two. It didn’t work, with Fletcher jumping right back in the fight to lead with the white flag waving. Fletcher left enough room heading into the final corner, Miles jump at the chance and went inside. It looked as if Fletcher was trying for the over-under move, however, Miles held his line and never drifted wide. At the line, Miles, a Mini rookie, scored his first Mini victory. Fletcher settled for second with Powell ended up third. 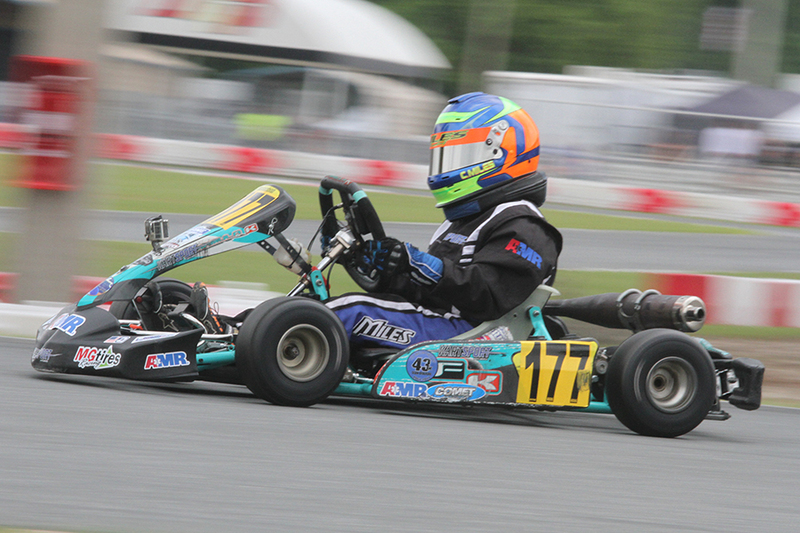 Mateo Rubio-Luengo (Benik) ran fourth with defending champion Brent Crews (Nitro Kart) coming from 18th to fifth. The entire day in Micro Swift was a battle between Ben Maier and Caleb Gafrarar. In qualifying, Gafrarar was able to get the edge, while Maier slipped past Gafrarar on the final circuit of both heat races. Gafrarar was able to get the last word, leading the majority of the Final and holding off Maier at the line for the victory. Cameron Brinkman (Merlin) joined them on the podium in third with Gavan Boschele (Nitro Kart) and Adam Brickley (Nitro Kart) completing the top-five.